Vacancies: Total = 5 (Five) Nos. (Adhoc) they are applying for. 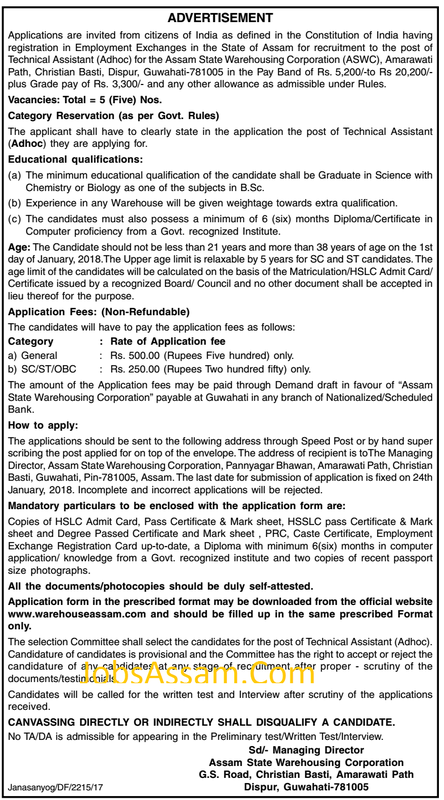 (a) The minimum educational qualification of the candidate shall be Graduate in Science with Chemistry or Biology as one of the subjects in B.Sc. (b) Experience in any Warehouse will be given weightage towards extra qualification. Computer proficiency from a Govt. recognized Institute. Pay : Pay Band of Rs. 5,200/-to Rs 20,200/- plus Grade pay of Rs. 3,300/- and any other allowance as admissible under Rules. Age: The Candidate should not be less than 21 years and more than 38 years of age on the 1st day of January, 2018.The Upper age limit is relaxable by 5 years for SC and ST candidates. The age limit of the candidates will be calculated on the basis of the Matriculation/HSLC Admit Card/ Certificate issued by a recognized Board/ Council and no other document shall be accepted in lieu thereof for the purpose. a) General : Rs. 500.00 (Rupees Five hundred) only. b) SC/ST/OBC : Rs. 250.00 (Rupees Two hundred fifty) only. The applications should be sent to the following address through Speed Post or by hand super scribing the post applied for on top of the envelope. The address of recipient is toThe Managing Director, Assam State Warehousing Corporation, Pannyagar Bhawan, Amarawati Path, Christian Basti, Guwahati, Pin-781005, Assam. The last date for submission of application is fixed on 24th January, 2018. Incomplete and incorrect applications will be rejected. Copies of HSLC Admit Card, Pass Certificate & Mark sheet, HSSLC pass Certificate & Mark sheet and Degree Passed Certificate and Mark sheet , PRC, Caste Certificate, Employment Exchange Registration Card up-to-date, a Diploma with minimum 6(six) months in computer application/ knowledge from a Govt. recognized institute and two copies of recent passport size photographs. All the documents/photocopies should be duly self-attested. 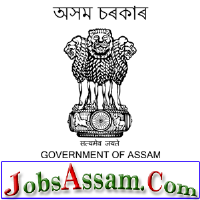 Application form in the prescribed format may be downloaded from the official website www.warehouseassam.com and should be filled up in the same prescribed Format only. The selection Committee shall select the candidates for the post of Technical Assistant (Adhoc). Candidature of candidates is provisional and the Committee has the right to accept or reject the candidature of any candidates at any stage of recruitment after proper - scrutiny of the documents/testimonials. Candidates will be called for the written test and Interview after scrutiny of the applications received. CANVASSING DIRECTLY OR INDIRECTLY SHALL DISQUALIFY A CANDIDATE. No TA/DA is admissible for appearing in the Preliminary test/Written Test/Interview.